Is this a house or a museum? You’ll see. I call Jyothika Baleri of Destination Designs the queen of ethnic design; and, with good reason. I’ve featured many of her projects here over the years. 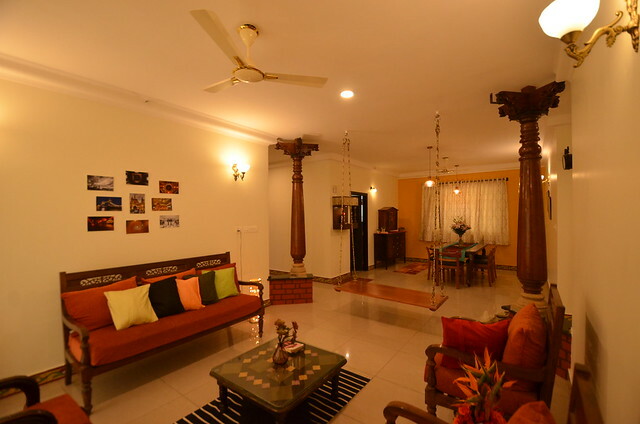 It’s time for a home tour again where handicrafts and art collected from all over India takes center stage. 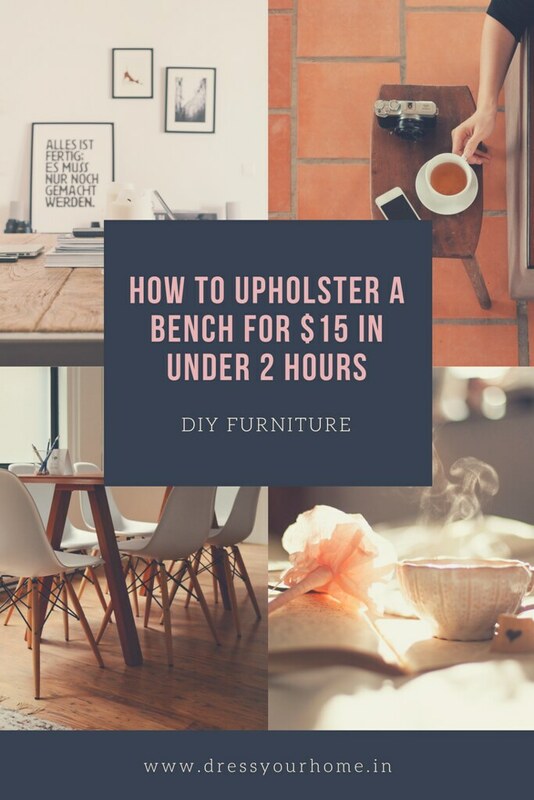 If you are an art aficionado who loves to visit exhibitions and craft fairs, it is fair to assume that you would have accumulated paintings, sculptures, and exquisite hand-looms over the years. 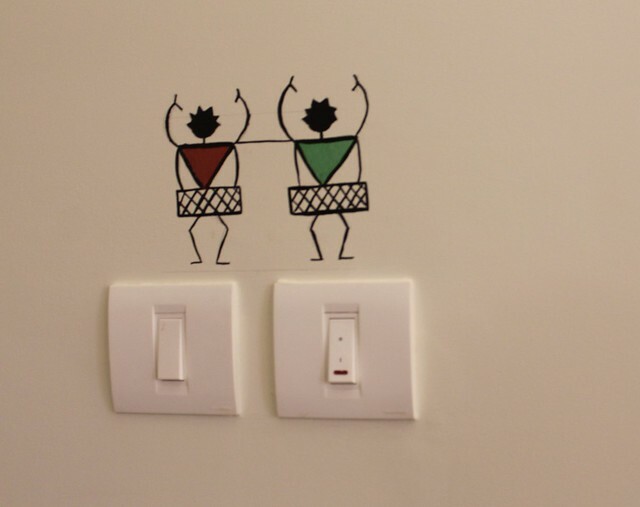 Are you at a loss as to how to display them around the house without making it look a museum? 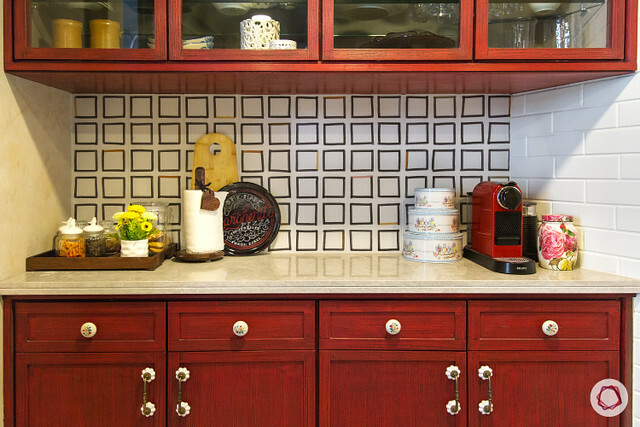 Jyothika solves that conundrum for us as she brilliantly showcases various avenues to display your heirloom. Be it that Tussar silk or Pattachitra painting cleverly in places you would least expect to see; and, some only for private audience. Ethnicity is the palette for this beautiful home. 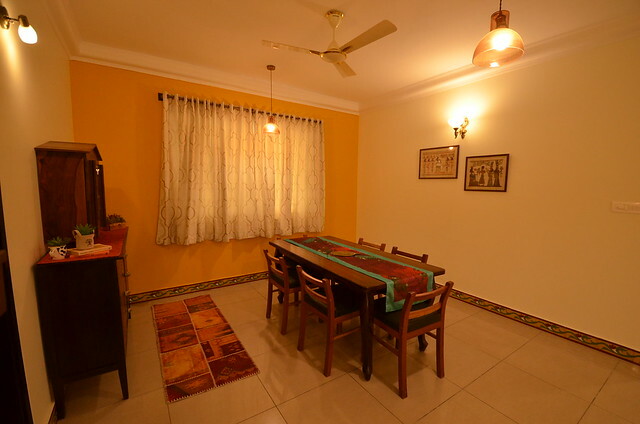 The owner of the home, Mrs. Vandana, is an avid collector of arts and handicrafts from around India. 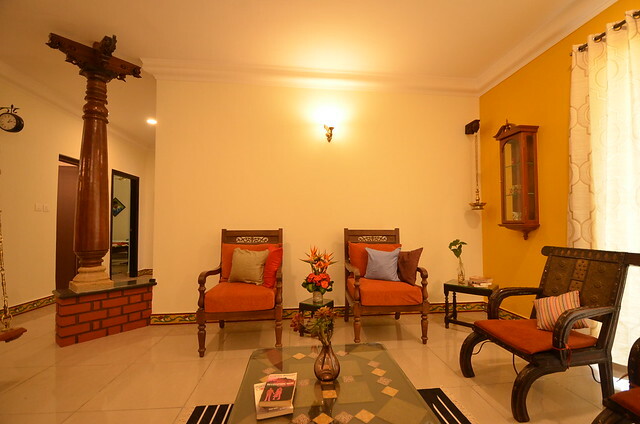 She wanted an essence of India in every part of the home. Here is what we put together after a year of discussions and design changes. 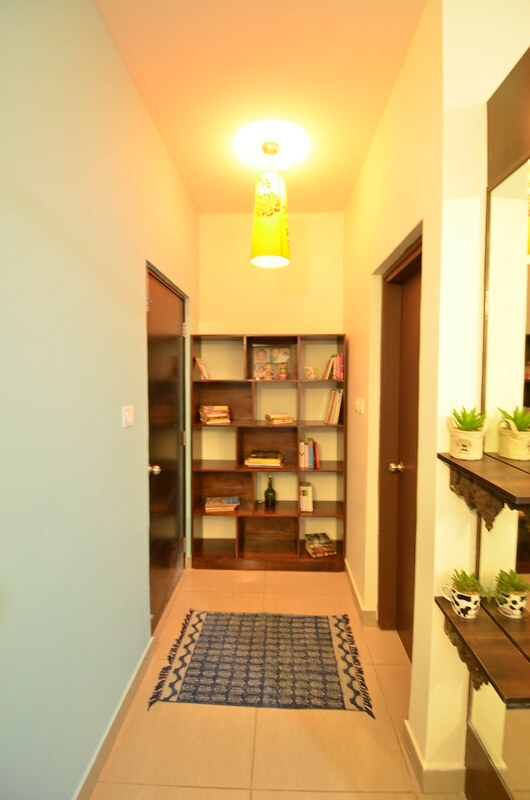 The living and dining area exudes warmth with the use of bold mustard paint on the walls and teak furniture. 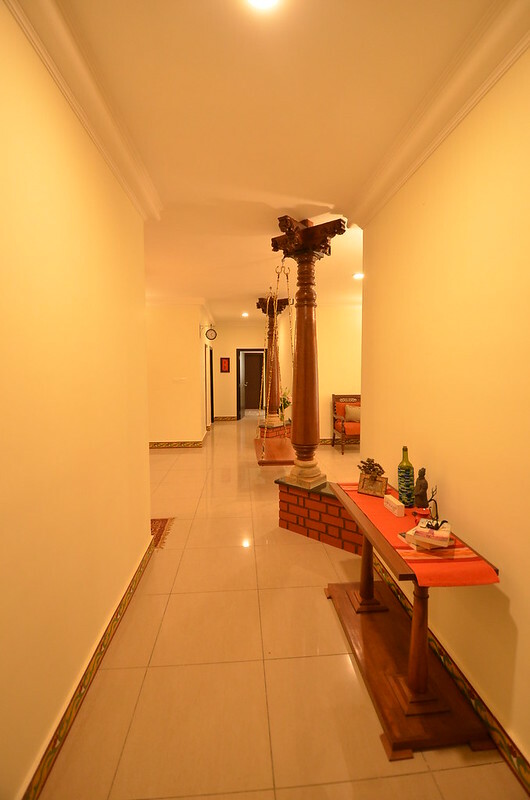 The Karaikudi pillars with the swing and the Athangudi tile skirting gives out a Chettinad charm to the space. 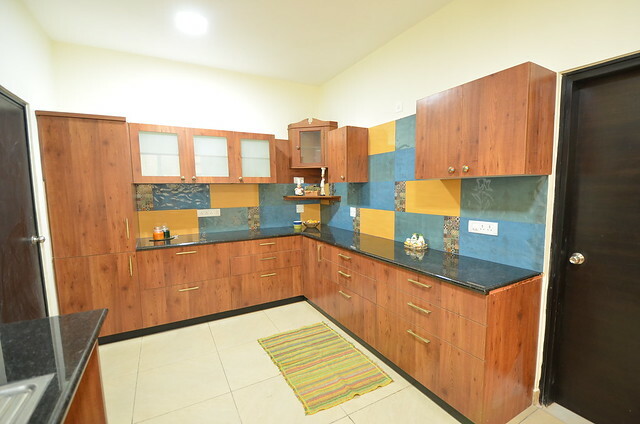 The kitchen is a very functional space and we brought in an Indian handicraft touch by using Jaipur blue pottery knobs. 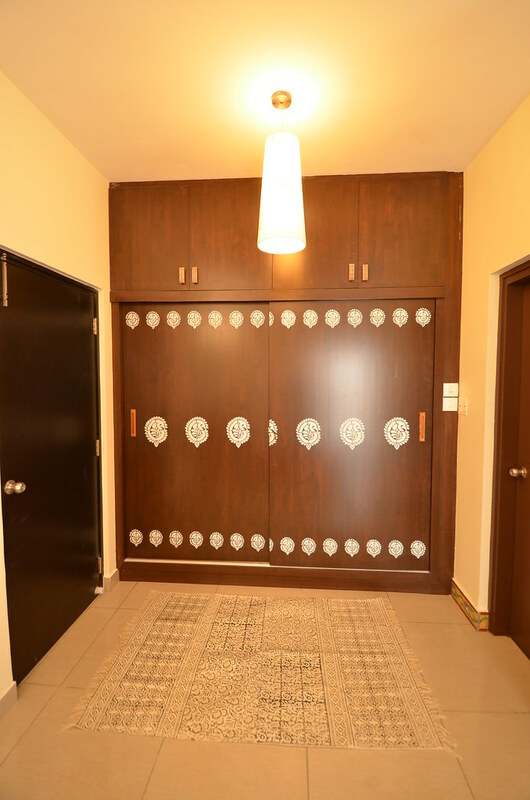 The modest guest room is enhanced with Saura panels on Tusser silk adorning the wardrobes and little Saura figures hand painted around the switch boards and mirror. Saura art originated from Raghurampur in Orissa. 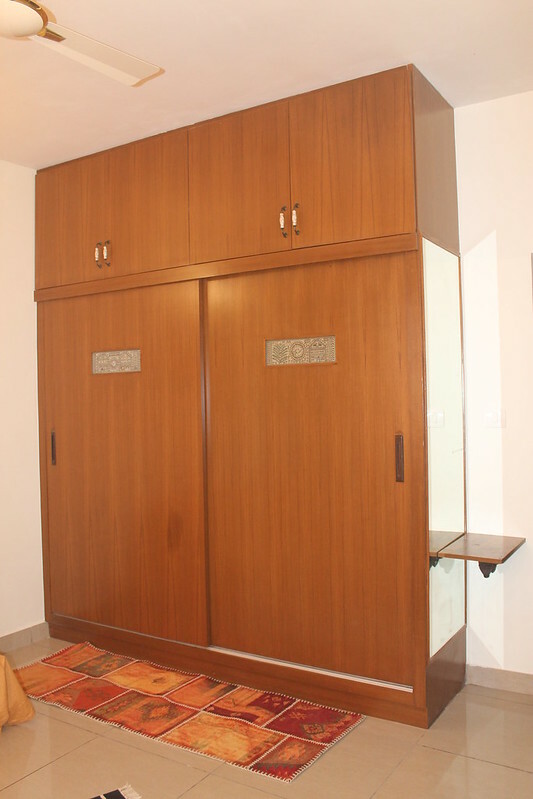 Master bedroom wardrobe is embellished using fabric printing blocks from Jaipur. 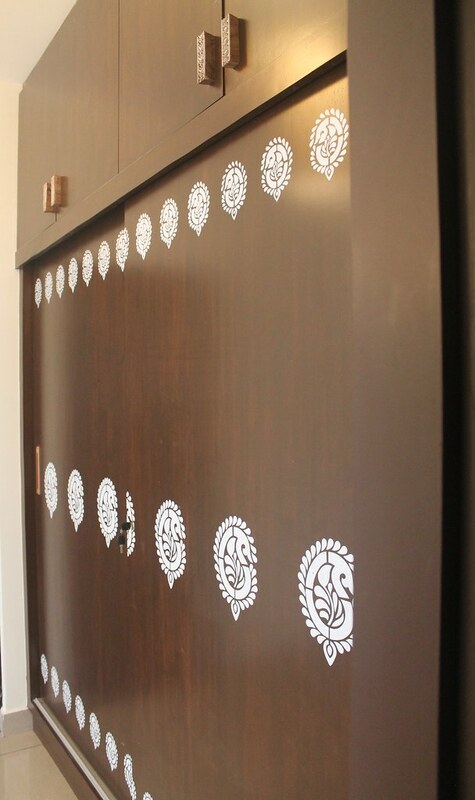 The wardrobe shutters are stenciled with paisley motifs to mimic the blocks. 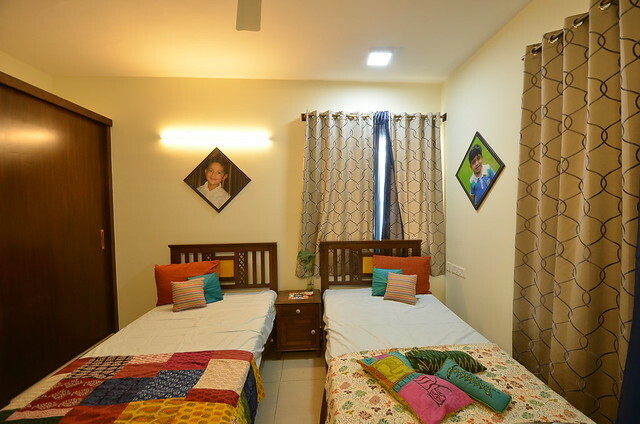 The children’s room is done very simple and clutter free as it is used by two boys.The wardrobes were given a zing factor by using handmade tiles from Delhi.The bedside table was also embellished with a handmade tile. 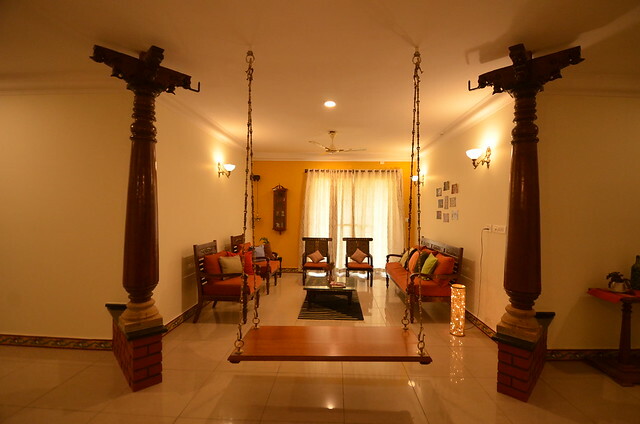 The movable furniture was all customized to look like the tables and cots from Chettinad mansions. 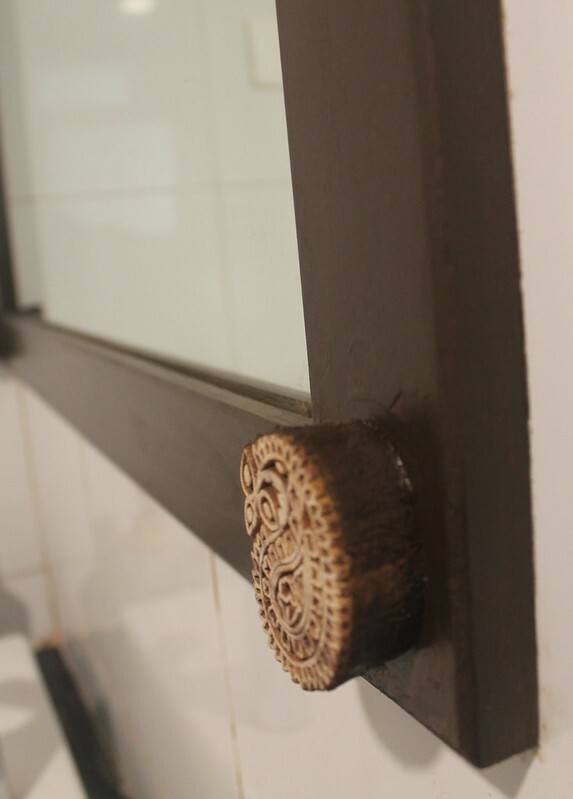 The mirror has cantilevered shelves resting on carved wooden brackets from Mahabalipuram. 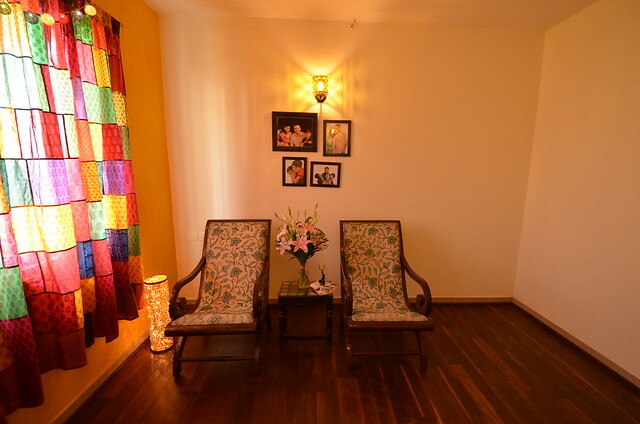 The entertainment room is kept very simple with chairs upholstered with Kashmiri embroidered fabrics.The Tv unit is from Rajasthan and the curtains are also typical cotton patchwork in bright colours that Rajasthan is known for. Cotton dhurries in geometric prints from Madhya Pradesh are used around the home to accentuate the space. Artist Ankita did a Saura handpainted panel around the mirror for the guest bathroom.The common bathroom mirror has Jaipur blue pottery tiles to embellish the frame.The master bathroom has fabric printing blocks on the frame. 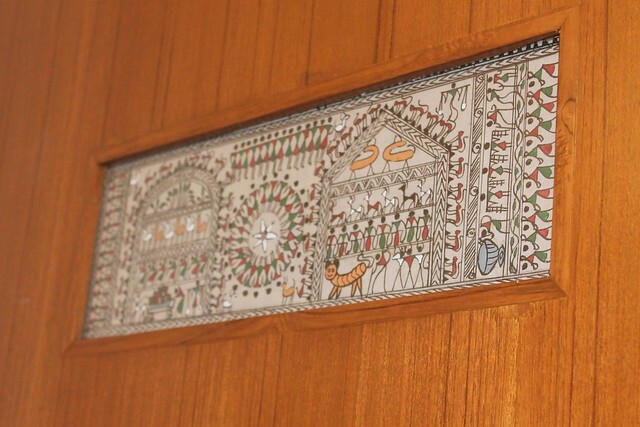 Kids bathroom has a hand painted frame from Telangana. If you are eager to see another traditional home, you may want to check this home in Good Earth.